Jingju master Shen Xiaomei, right, admires the Chinese opera doll collection of Elizabeth Wichmann-Walczak, the first non-Chinese to perform jingju in China. But before we get too far into this story about Chinese opera, we should dispose of the term entirely. It's "jingju." Got that? Jingju. "'Jing' means 'capitol' and 'ju' means 'drama,'" explains UH-Manoa's drama department's Elizabeth Wichmann-Walczak, the first non-Chinese to perform such opera in China. "So, it literally means, 'The Drama of the Capitol,' a specific form of performance. In a nation of hundreds of dialects and regional performance forms, 'Chinese opera' is too general. 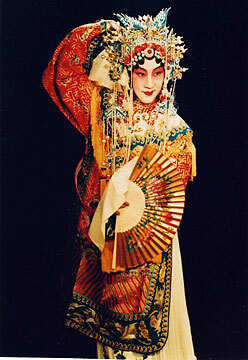 There are 300 forms of Chinese opera! It's like referring to jazz as just 'American music.'" She also pointed out that the difference between a regional dialect and a national language is often just who has the biggest army, but point taken. Jingju it is. That this comes up at all outside of China is largely due to jingju master Shen Xiaomei, an extraordinary practitioner of the performance art. Shen received an honorary doctorate from the university at Friday night's opening of the latest UH production of a jingju classic, "Women Generals of the Yang Family." The Honorary Doctor of Humane Letters degree awarded Shen recognizes her contributions to teaching jingju at UH for the last quarter-century. Thanks to Wichmann-Walczak's translation skills, we were able to have a chat with Shen. Actually, it's Madame Shen, an honorific denoting her status as a master of arts. In Chinese style, Shen credited her ancestors and teachers, particularly Mei Lanfang, a kind of Jedi master of the Beijing opera, who wowed audiences around the world in the 1930s with his performing skills and who is largely credited with international recognition of jingju. 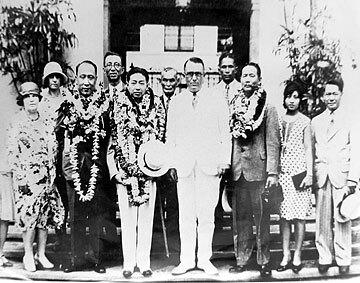 Master Mei, with the hat, is welcomed to Hawaii in 1930 by by city officials. Master Mei was honored by Pomona College with a doctorate during a U.S. tour hosted by Mary Pickford, Charlie Chaplin, Douglas Fairbanks and Paul Robeson, and also performed in Honolulu. It has been 75 years since such an award has been given to a Chinese artist by a Western university, and so Madame Shen's new honorific is being viewed as something of a cultural milestone in China. And Shen was Master Mei's youngest student. "My parents liked jingju so much that when I was in grade school, my mother invited a jingju teacher to the house so she could learn to sing the songs. I picked it up then. My mother was from Beijing -- I was born and raised in Shanghai -- and so the opera represented home to her. Loving jingju is a family tradition. "When Master Mei came to Shanghai to perform, I fell in love with his skill. Most people who are good at something have one special thing you can learn. It can be copied. But Master Mei was absolutely complex and effortless, an ease and perfection of performance. Yes, it came from within but it was also physical. No matter how he moved, it was beautiful from every angle." Wichmann-Walczak said the film record of Mei's work might have been lost. "During the Cultural Revolution, films of Master Mei's performances were buried in the ground to save them. When I was studying there, the films were dug up and presented. Like a good student, I was there with notepad to record it all. The film was scratchy and damaged and not in good shape. But I was mesmerized, absolutely mesmerized." Shen nodded. "All you saw was the character, not the performance. Master Mei was one of those great artists who transcended technique and cultural boundaries." "I forgot to take a single note!" laughed Wichmann-Walczak. Madame Shen performed jingju for many years and now promotes the art worldwide. Shen explained that Mei's triumphant cultural exchange 75 years ago was two-way. "While he was the toast of Eisenstein and Brecht and Chaplin, flabbergasting them all with his skill, Master Mei absorbed the culture of the West as well. It informed his work, his insistence on studying the changing aesthetic needs of audiences." This dedication became a lifetime calling for teacher and student. Shen herself was touted outside China, winning first prize as China's representative to an international festival of young peoples' performing arts in Vienna in 1959, and touring Iceland, Finland, Norway and Sweden. "Yes, the cold countries! It was very exciting -- but there wasn't much time to meet local artists. We were bound to sightseeing and museums. By the time we were touring places like Canada in the 1980s, it was vastly different, much more relaxed." Except for brief periods of forced inactivity -- Mei during the Japanese occupation, Shen during the Cultural Revolution -- they continued to absorb, perform and teach. "When I started with Master Mei, I was very small, his youngest disciple," Shen said. "At that age, you start with surfaces and techniques. Later, you work on internal aspects. There is a difference in the way he taught and the way I teach. In the days of Master Mei, the traditional route was for the master to demonstrate and the disciple to imitate. What has changed is that we now discuss the why as well as the how. Traditional jingju focused on the conventions -- hands, eyes, torso, speech, steps -- all in harmony." Wichmann-Walczak recalled Shen teaching her the title role in "The Drunken Beauty." "You enter a garden being 'beautiful,' and you are thinking and doing 'beautiful,' but you need 'being' beautiful to succeed. It demands both inside and outside disciplines, and conscious collaboration" between inner self and projected self, or the role. Shen spent more than half a century with the Jiangsu Province Jingju Company as an actor and teacher, known both for restoring traditional repertory and creating populist, nonpolitical works. "It's the new productions where you can best incorporate new influences and experiences. The traditional productions are already set, but you pay attention to audience reaction to fine-tune performances. Yes, one eye on stage and one ear on the audience. One must listen as well as speak." Shen retired from the stage in 1995 to create the Jiangsu Province Program for Promoting Jingju Appreciation in Education, a kind of artists-in-the-schools program inspired by her experiences in Hawaii, and a first in China. "What has happened in the last century is that arts that are -- were -- very specialized to one culture, like ballet in France and Russia or opera in Italy or jingju in China, have internationalized. Jingju now belongs to the world, and the University of Hawaii played a large part in that," said Madame Shen, now a diplomat as well as a teacher and artist. "It's exciting when our opera inspires students to learn more about China. It's a testimony to the beauty and power of jingju on an international scale."